It’s Always Time to Celebrate with our LA 75 Cocktail! Being from France, Natacha always has some champagne on hand to celebrate life’s special events; there’s nothing like bubbles to share your your happiness with friends and family! The LA 75 is a twist on a classic, where you can easily substitute a dry prosecco or cava to the traditional champagne. This drink is perfect for brunch, but also works any other time of day. It is light, refreshing, and the strawberry brandy adds a welcomed fruity note to this elegant drink. Shake the brandy, lemon juice, and simple syrup with ice and strain into a champagne flute. 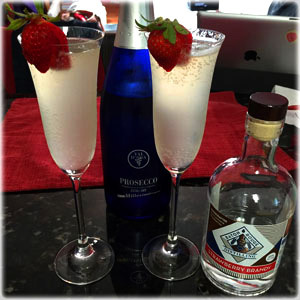 Add the chilled prosecco and garnish with a strawberry.